Kinski - "Down Below It's Chaos"
I believe this title to be the Seattle space rock four piece's third CD on the Sub Pop label. Just as good as all their previous efforts, I thought. Noticed that ' Down Below It's Chaos' is a mostly instrumental CD with a limited amount of vocals. It opens with a decent instrumental, "Crybaby Blowout". Next up is a heavy all-out space rocker - "Passwords & Alcohol", the well played psychedelic "Day Room At Narita Int'l" and the jamming "Boy Was I Mad". I wanted to mention how much I appreciate Kinski's full-hearted use of the early ' 70's fuzz guitar, fine keyboard playing and the constant effort to give us long time fans of experimental / space rock a band as such for the 21st century. I was quite impressed with Matthew Reid Schwartz's superb keys work and Chris Martin's ripping guitar on "Child Had A Train To Catch", the stunningly atmospheric "Plan, Steal, Drive" (sort of reminds me of Hawkwind - possibly the disc's best track altogether), the melodic "Punching Goodbye Out Front" and the nine-minute fantastic head-tripping epic "Silent Biker Type". After my brain stops spinning and catches up with the rest of my body, I'm going to listen to this CD again. Personnel: Chris Martin - guitar & vocals, Lucy Atkinson - bass, Matthew Reid Schwartz - guitar, keyboard & flute and Barrett Wilke - drums. Belongs right alongside of your CD's by Bardo Pond, Acid Mothers Temple, Spiritualized, Abunai! and Spacemen 3. Be sure to check out their My Space site - you'll be glad you did. A couple of songs from this title are played in their entirety. Recommended. 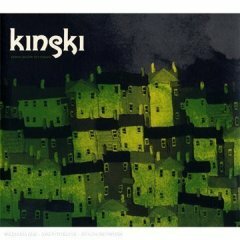 For more information you can visit the Kinski web site at: http://www.kinski.net. Visit their Myspace site at: http://www.myspace.com/kinskispace. Visit the Sup Pop web site at: http://www.subpop.com.